The holy-grail of comfortable fashion: it’s time to shop for the latest fashion in men’s sweatpants from your favorite brands. If you’re looking for something to really relax around the house in, you can’t go wrong with a classic pair of gray sweatpants (can you believe there’s a ‘classic’ to this look?). 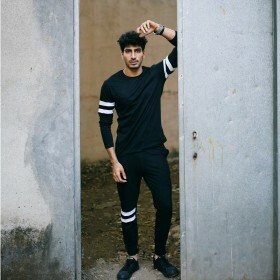 If you’re searching a bit more high-fashion then look out for side-stripe detailing, a more tailored fit and sweatpants that really look like formal pants. When styling for high-fashion, don’t be afraid to pair men’s sweatpants with more formal shoes, luxury sneakers, a structured bomber jacket or fitted tan coat – anything goes these days!